That's Cyndi Spivey from Walking in Grace and Beauty. Cyndi is a fashion blogger, so she styled me for the conference. How's that for a deal? I wish I'd had her do my make-up! 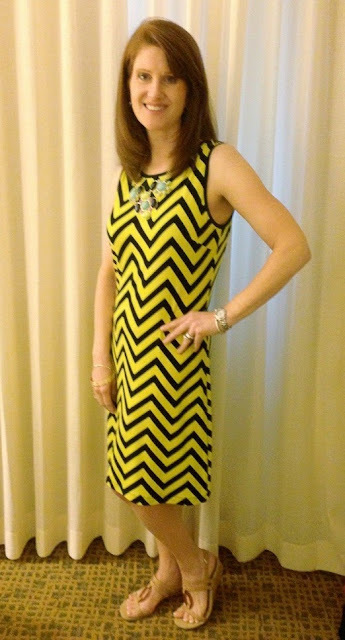 Here I am wearing a chevron dress that Cyndi accessorized for me. I had no idea what to wear with such a bold pattern, but she knew! You may recognize Ginny from Organizing Home Life, Leanne from Organize and Decorate Everything, and Becky from Organizing Made Fun. I figured that if I hung out with organizing bloggers, perhaps some of their expertise might rub off on me. I'll let you know if it works. 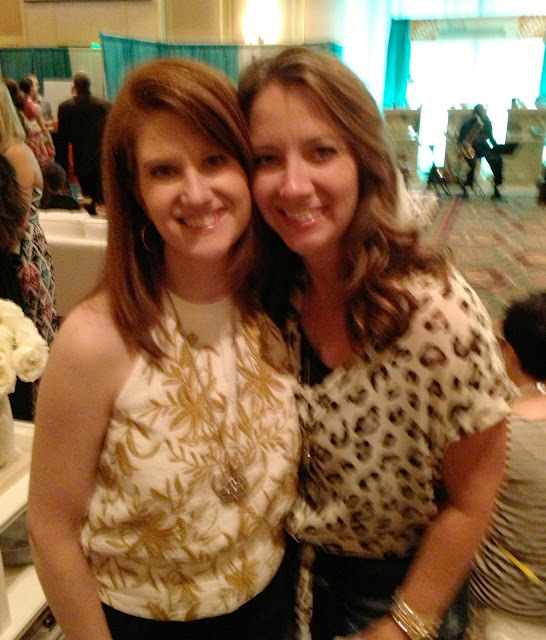 I didn't get many photos of the conference organizers, but here's a pic of me with Sarah from Thrifty Decor Chick. Such a lovely person inside and out. Let's pretend that the fuzziness of the photo is just a soft focus effect, okay? And of course I had to get a pic with Traci from Beneath My Heart, one of my dearest blogging friends. Bottom line? The conference was awesome. The speakers were excellent, the workshops were fantastic, the parties were fun, the sponsors were incredibly generous. In the end, though, the very best part was simply getting to hang out in person with these lovely women who have become my friends. The Haven Conference was such a blessing to me. I thank God for the opportunity to be there! 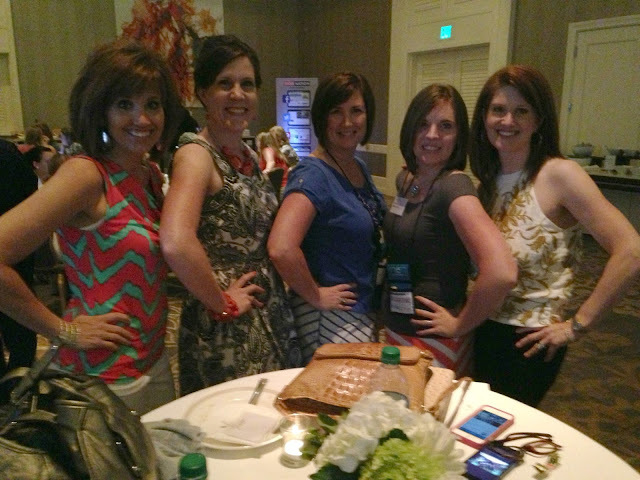 Have you ever attended a blogging conference? If so, what did you think? Wow, looks like you had a great time! And I love the dress! :) Hopefully you learned something to boot...pun intended? It was a great conference! So nice to meet you face to face Richella, enjoyed our paint class too! I guess I am behind...but I just discovered the Haven conf this week. Looks like a blast! I so want to attend one now. thanks for sharing. Blessings! Glad you had such a great time at Haven! I went last year & loved every minute! Sad I missed out this year! You and Cyndi are just too cute. I wish I had more time to spend with you 2, I know it was fun in your room. So glad you came to Haven with us, Richella. You are precious! I love that you and Cyndi roomed together! Blogging conferences are a new idea for me--just learned about Haven this week. The longer I blog, the more I want to meet my fellow bloggers. I want to learn about conferences and maybe plan some get-togethers with those in my area. Looks like you had a wonderful time! It looks like you had a blast. I would have loved to have gone but this year just wasn't the year. Maybe next year. 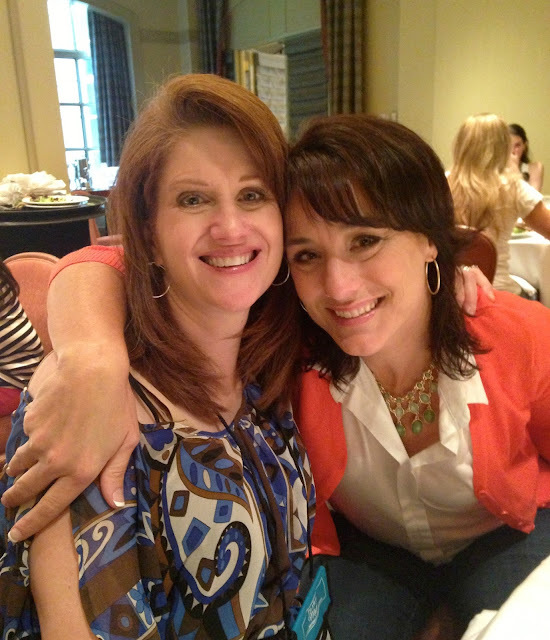 Richella...I am so glad you had such a great time at the conference! AND how neat that you and Cyndi were roomies! I love her too. And Traci! Such a lovely group of women! You and Cyndi both looked so stylish at Haven. I loved all of your outfits but my favorite was the chevron dress. Cyndi picked the perfect accessory for it. I hope to see you again soon! Traci and Cyndi both went but didn't room together? What a blast! I have been enjoying all of the posts from blogland about Haven. I would love to go at some point. It was so good to meet you, Richella, at Haven. I enjoyed our morning devotion and prayer so much. I needed it! 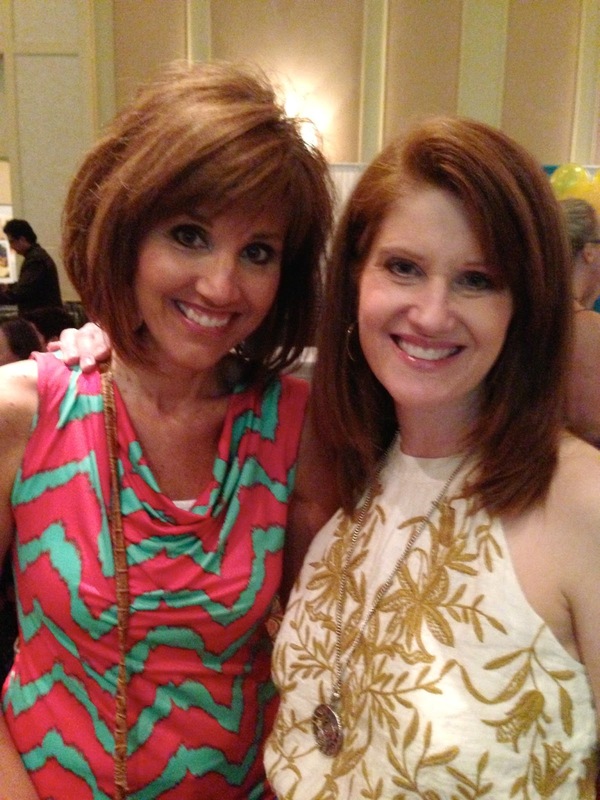 It was so great meeting you Richella! I wish we had more time to sit and chat, too. We need a week long blogger retreat so we can all get more time to really sit down and talk! Great recap, and I hope to see you again next year! You look so cute in all of your outfits -- Cyndi had a great subject to work with! I'm going to try that "Cyndi pose" and see if it makes my arms look better! That was such a fun event. I'm glad I got to meet another NC blogger!